Geo-Environmental Services Limited was instructed by Imagination Design Limited to undertake a geotechnical ground investigation in relation to proposed cut and fill landscaping works and drainage design. The grounds of a residential property were to be re-shaped in order to create riverine and terrace plains in addition to re-routing a portion of the carrier stream which flowed into lakes and watercourses within the estate. The objectives of the investigation were to provide additional information on the ground conditions in the areas of proposed cut and fill and to obtain soil samples for geotechnical testing. A stability assessment of the proposed terrain model was required together with information of the method of compaction of the site-won material to be used in the earthworks. In addition, soakage testing was required to provide soil infiltration rates. Based on the findings from the exploratory holes, the bulk of the cut was to be in Chalk albeit some of the chalk may comprise previously reworked material. As such recommendations were given with respect to special requirement for earthworks in chalk. 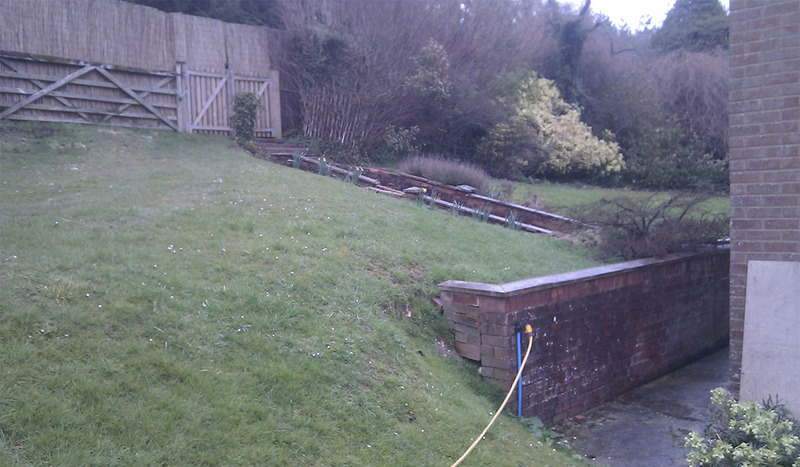 Three slope sections were modelled in order to assess the stability of the various slopes post construction. The sections were selected based on being indicative of the final profile at each end and the middle of the proposed earthworks. All modelling was undertaken using the Fine software package, Slope Stability v15, with the slope stability assessment being undertaken in accordance with Eurocode 7: Geotechnical design. Design Approach 1 was used with utilisation factors calculated for both Combination 1 and 2 partial factors. What are the benefits of a Slope Stability Assessment? The objectives of a slope stability analysis can be varied and may include an assessment of the impact a new development may have on an existing slope, designing of optimal slopes with regard to safety, reliability and economics, designing possible remedial measures, e.g. soil nailing and soil reinforcement. Improved drainage to enhance stability by controlling the flow of water. Planting appropriate vegetation to effectively bind the slope. Reducing the surcharge at the crest – by using lightweight fills. Increasing the surcharge on the toe at the bottom of the slope. Soil stabilisation, e.g. with cement. Using geotextiles to reinforce the earth or soil nailing. Reducing the height of the slope.